The increasing availability of Web services raises the interest of grouping them into service communities. VISCO offers a community concept based on the assumption that a community contains Web services with similar functionality but with different non-functional characteristics. Each service in a community has its own specific WSDL file, without any associated semantics, thus, making it hard or even impossible for automated tools to identify common functionality among the services. Therefore, VISCO follows the idea of an abstract community interface that provides the functional blueprint for the Web service community. Every Web service community member implements the abstract community interface. 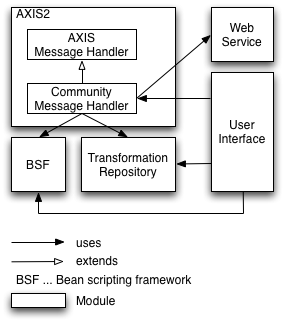 Our current prototype implementation uses the Axis2 framework as Web service container. We provide a basic community handler implementation that extends the Axis handler class. Currently, we are using XSL transformations to create Web service community compliant Web service calls. The first demo provides a graphical representation of the Web service community description. The description shows the user tagging and associations between the user tags. The line width indicates the weight of the association given by the users. The second demo shows a XML representation of the Web service description. The third demo illustrates a XSLT based mediation with a Web servioce community. The Web service community WSDL description can be found here. The mediator transforms Web service community SOAP requests to Web service provider (the corresponding WSDL description can be found here) compliant SOAP requests. Note that the links above are disabled. The VISR project aims at the integration of different Web service registries in a dynamic Web service environment. This environment is characterized by nimble Web service providers and ad hoc Web service provision. Therefore, VISR adopts the existing (centralized )Web service registry models and provides an integration layer over existing Web service registries (e.g. UDDI, ebXML). To support ad hoc service provision, the integration layer uses a tuple space for the decoupling of communication between Web service requester and Web service provider. VISR structures existing Web service registry content in views. Views are aggregations of Web services and provide an logical umbrella for the communication between Web services. In addition, views unify the access to Web services by the provision of a standardized interface for communication based on a shared tuple space. Public Web service registries are usually centralized systems that tend to be rather inflexible. We consider a distributed Web service registry solution where every Web service provider offers a Web service registry news channel that serves as part of a distributed Web service registry. This approach offers several advantages, since it provides for a (i) lightweight Web service registry implementation, (ii) it is possible for Web service requesters to use existing RSS news reader to browse through Web service registry content, (iii) subscribed users receive changes within the registry (new Web services, removal of Web services) automatically in their news reader, (iv) Web service registry content can be arbitrarily filtered by existing RSS news aggregators thus creating Web service communities and (v) the Web service registry content is being distributed and automatically replicated among the clients. The AWSR aggregator offer a Web interface for the core functions and SOAP interface as well. The source code can be downloaded here. You can register your AWSR feeds using a Web formular. The AWSR feed registration formular can be found here. You can add a AWSR item to the AWSR feed here. AWSR feeds are already used at Wirtschaftsauskunftei WISUR an austrian company. The corresponding AWSR feed can be found here.